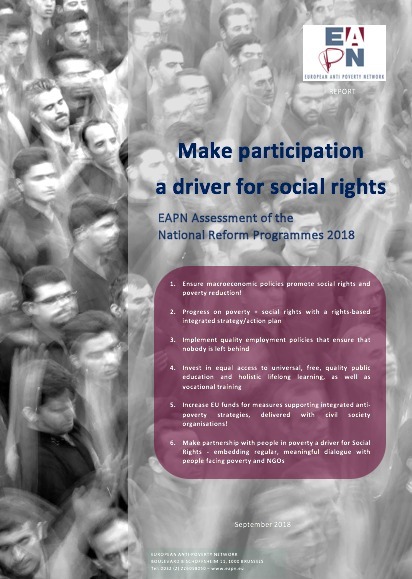 EAPN presents its assessment of the 2018 National Reform Programmes in terms of poverty: Make participation a driver for social rights. This Report provides a synthesis of EAPN members’ assessment of their 2018 National Reform Programmes. It considers how far Member States have pursued policies which contribute to key social targets of Europe 2020 (poverty, employment and education), investing in social rights and standards to ensure inclusive growth, and demonstrating an increased commitment to quality participation of civil society organisations and people experiencing poverty. This report is based on a questionnaire and scoreboard responses from 13 national networks as part of the EAPN EU Inclusion Strategies Group (AT, BE, HR, EE, FI, DE, IE, IT, LU, PL, PT, SE, UK), and incorporates inputs from other members in a workshop exchange held in Brussels on the 6 July (BG, CZ, FR, LV, LT, MT, NL, RO, Eurodiaconia and Age Platform). Responses to the final draft were received from EAPN BE, FR, IE, IT, LU, NL, UK, Eurodiaconia and FEANTSA. with people facing poverty and NGOs.